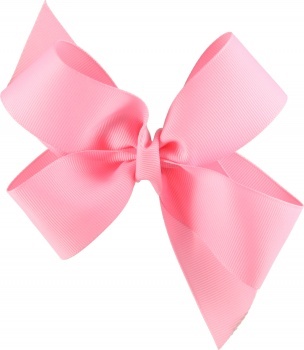 Pretty in Pink is all she will say with this styling boutique hair bow. This 1.5 inch Pink Grosgrain ribbon is attached to a 2 inch French Barrette. The center is wrapped with the same size pink ribbon. This is a great base bow to add some of the toppers to, all you do is slide the topper under the center part and you can change the total look of her bow and outfit. This is one bow a girl's wardrobe has to have.